YES! Fresh Baguettes ever day in the South of France! The South fo France is so special! I have been touring groups since 1993! From the little villages of where Julia Child purchased olive oil to blown glass. Chef taught classes and more. Classes, lodging in a remarkable villa in a quant little village, all ground transportation is included. Check out the brochure for all of the details. If you are interested we are limited to 4 couples. Email ggeary@aol.com to serve your space ASAP. Strawberry Day on CBS8 San Diego! Here are the recipes ahead so you can follow along! Happy Berry Day! I will post the link to the show if you are not in the San Diego area! A very moist and flavorful cake.. I like to use very very ripe bananas that are very dark. The sugars come up and wow.. so much flavor. Use any kind of Bundt tube pan for this recipe. A trick I tell all of my students when you are making a Bundt cake… No need to grease and flour the pans as it is too difficult to get into all of the cracks and crevasses.. Spray pan with a non-stick spray. After the cake has completely baked, set a timer for exactly 10 minutes. Then invert directly on a cooking rack. The pan will lift off perfectly. Sunday is the day that Hollywood Goes Crazy! 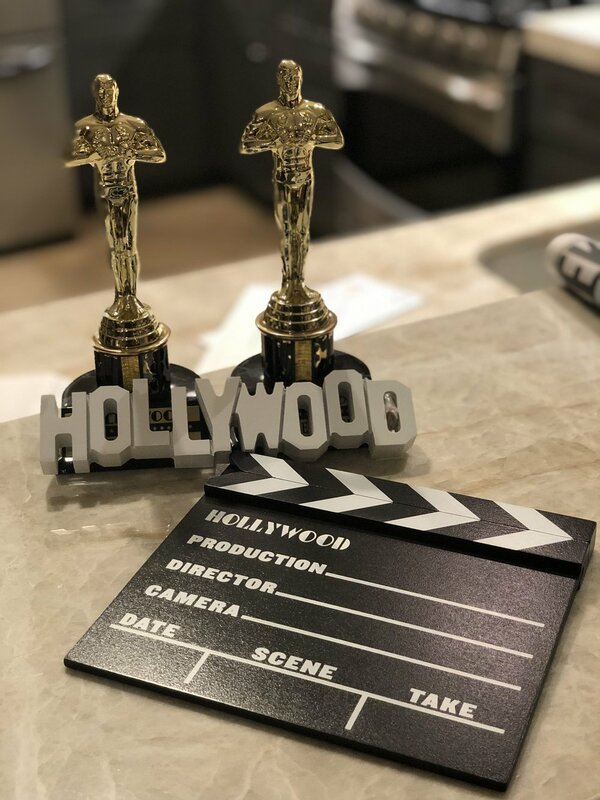 I was out on Hollywood Blvd last week, about a block from the theater that houses the awards.. The street was closed and everyone was getting ready for the big night.. I will be on CBS8 San Diego on Friday doing my segment on the Awards dinner. Here are the recipes for the show. All of them have something to do with “Old Hollywood” I hope you enjoy! 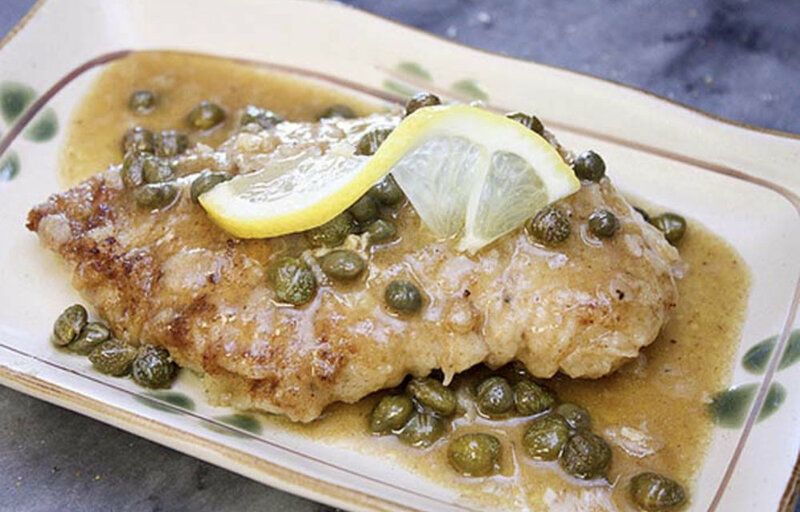 Chicken Piccata: A great dish from the famed Dan Tana’s on Santa Monica BLvd. This is where so many stars go out after. Sour Cream Raisin Biscuits: Award Winner Clark Gable’s Favorite! He would order them from The Brown Derby.. They even catered his 40th Birthday and served them! Canola Taco Popcorn: I created this for an event n Hollywood for Canola Oil. Enjoy! I always say in my classes..” If you have the best ingredients and tools you can make anything perfect”. The differences in a good cookie and an award winning cookie is the ingredients I use. In the recipe I have placed hyperlinks as to the best items I use. Here is a list and why. Silpat: These are silicone mats that you make your cookies on. The first came from France. When I worked in my first French ran kitchen the pastry chef had one since they were $50 at the time. They do last a life time. 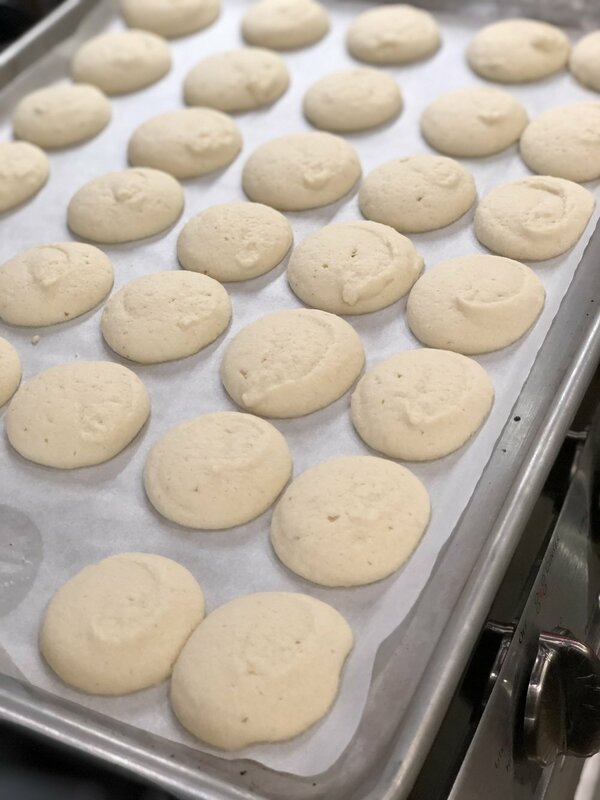 Half-Sheet Bun Pan: These will fit in most all ovens. They have sides so the cookies will not fall off when you pull them out of the oven. Heavy duty thickness they will last forever. Get a few sets! The Silpats fit perfectly in them. #20 Disher: Also known as a portion scoop. The number is in the “flipper” which means how many scoops you get out of a quart of something like ice cream or mashed potatoes. 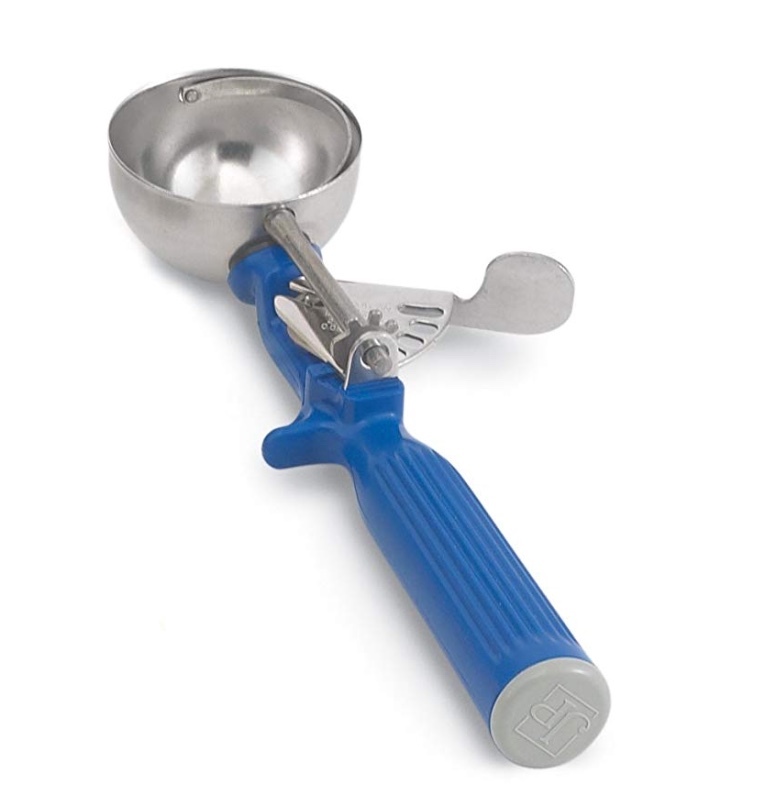 DO not use these as ice cream scoops as the flippers will break. The come in sizes 6 to 100. a number 100 is very small.. enough for a bonbon. Belgium Chocolate Chunks: Pastry chefs have been using these for years. We melt the chunks down for icings and desserts. They are pricy.. But you are worth a real chocolate chunk. Nielsen-Massey Madagascar Bourbon Vanilla Extract: Ok. let’s face it. Vanilla is skyrocketing. By the time you buy a bottle the price will change in a day or two. Nielsen-Massey is the best on earth unless you make your own from beans that you have harvested in the jungles in Madagascar (Ok I have done this). Honestly, for the full flavor if you use another vanilla you will not get that perfect cookie. And seriously… You use less than 20 cents per batch. It is just the initial outlay. Nielsen-Massey Pure Almond Extract:: A few years back N-M started making extracts. Lemon, Orange, Cinnamon.. Almond. Not fake tasting what’s so ever. Try all of them! I hope you enjoy the cookies.. While most of the nation is under a very cold spell and here in California we have something coming out of the sky that they call “Rain”. Stay safe! Oxo Cookie Press on Amazon. Buy it Here. It really is the best on the market with disks for every holiday! Well it is my TV Anniversary this week. 25 years from when I started doing Live in LA on the local station in Los Angeles. I moved a few months later to Mike and Maty Show which was national. Then worked for the Food Network traveling around the country to talk about the new network all on food! Well this past week I will have been on 3 stations. Two in San Diego (My regular and a new one) and Hallmark for Home and Family. Here are the recipes for Fridays Show. Enjoy! 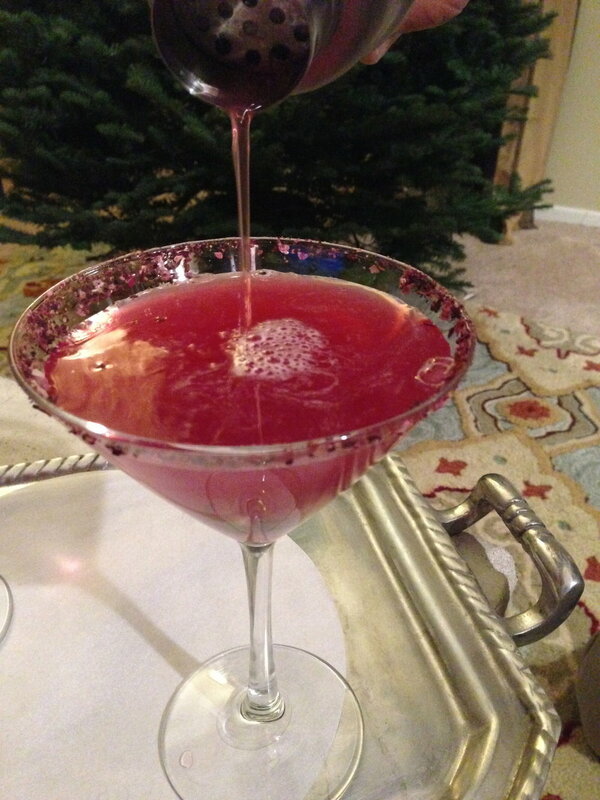 Four recipes for your Holidays Brunch Menu! Enjoy and now eat some cheesecake! Debbie and Cameron in the kitchen! I sometimes need my memory to be jogged. For 10 years I was the Pastry Chef for the Walt Disney Company Theme Park Division. Until someone asks about one of the desserts I forget what I used to make. 25 years ago this week we were notified we would be closing the bakery. Only 3 years prior, I was the first Disney Chef to be awarded a culinary medal, so I was a little surprised that they would be now buying frozen product to serve. Recently someone asked if anyone had the recipe for the Macadamia Pie. I got into my files of the huge recipe that made 70 pies and cut it down. Then I tested the recipe, now we have it for you. Many of my Disney Recipes I would have to cut into amounts for the public as they would be requested from guests to the LA Times Food Section. 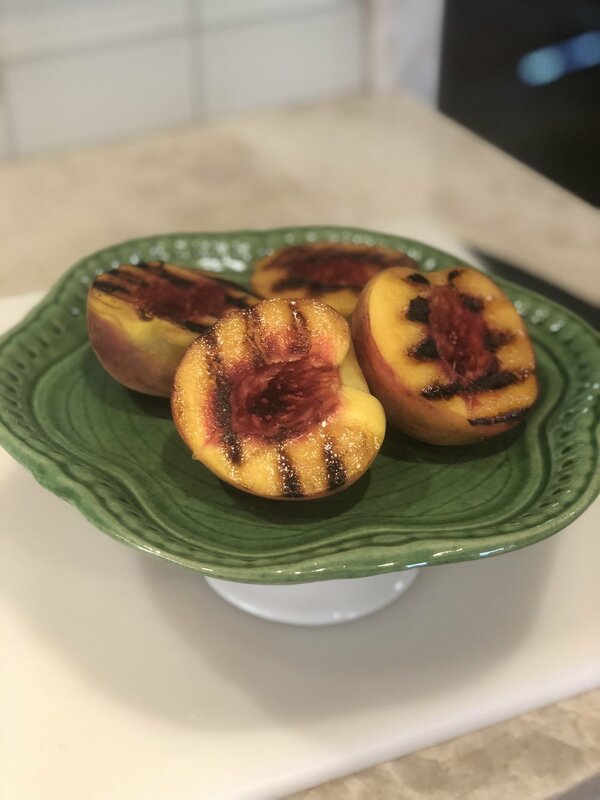 This recipe never had been requested so I had to test it myself this weeked. The Tahitian Terrace was a Polynesian themed restaurant at Disneyland Park in California. It was placed next to the Enchanted Tiki Room attraction in Adventureland. Popular dishes to enjoy during the themed native dancing show were skewered chicken, tropical fruit salads and other island dishes. It was in operation from 1962 to 1993 when it was replaced by Aladdin’s Oasis Dinner Show which only lasted 2 years. This Macadamia Pie dessert was on the menu from the late 1980’s to the closing of the venue. It was served with vanilla ice cream for $2. Friday my segment on Pecan Cheesecake Pancakes was broadcasted nationwide. Incase you didn’t see it I have attached it and also the recipe for you to make some great pancakes for these upcoming cold mornings! Holiday cookies are coming soon! I will be on Home and Family ~ Hallmark December 4th. Set your recorders! Make the pancakes, watch the segment and let me know what you think! Holiday Season! Wednesday December 5th from 5-7pm Tommy Bahama Home Store at Fashion Island. Book Signing and event. Come past for some cheer and get a book signed. If you have any other of my books bring them for personalization. See flyer for more information and RSVP. Books will be available for purchase also. The Official Candy of Ohio… Buckeyes! I just finished up classes in Atlanta and tomorrow I head to Florida for 16 locations! Make sure you get my emails for the schools and locations.. All at Publix Apron Cooking schools. I will be doing Cheesecake Classes and Book Signings! Here is a recipe for Buckeyes. Make them and enjoy! A flavorful Fresh Peach Crisp with a nutty crunch topping. Arnett Farms at the Hollywood Framers Market Sundays on Ivar and Hollywood Blvd. In 1981 while working for Marriott Hotels I competed in a pastry competition. I took first place with my Blueberry Muffins. It was also the very first thing I showed on morning TV. in 1993 in Live in LA. 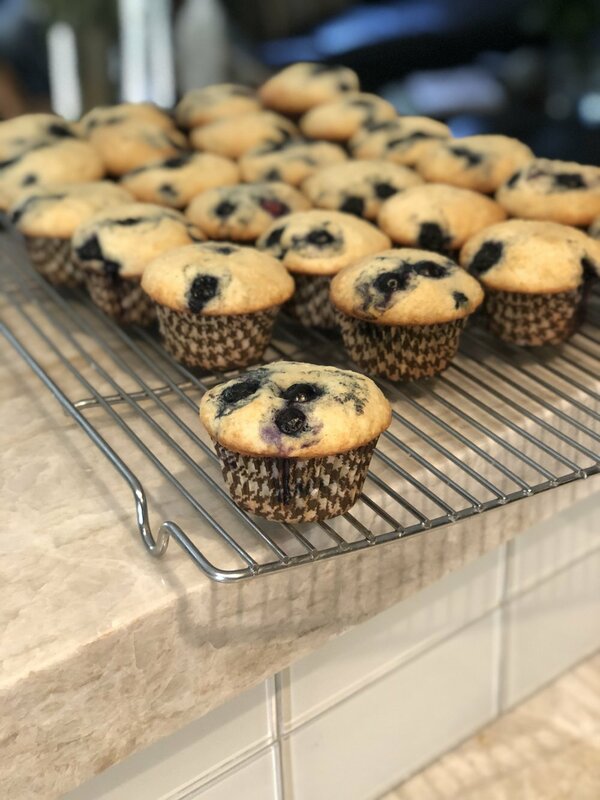 I still have not found a better blueberry muffin. To make cookies and muffins uniform you need to use a "disher". They look like an ice cream scoop with a spring loaded handle, but it is for food. They are numbered from 100 to 8. 100 being the smallest. The numbers mean how many scoops you get out of a quart of mashed potatoes. Here is the one I recommend. With so many on the market, you need a disher that is made for heavy use. We all have had "Nilla® Wafers. But I am sure you have never had these remarkable almond ones. Here is an easy recipe.. The hardest part is using a pastry bag with a round tip. Almond flour can be found most of the time at Trader Joes, Major markets in the baking section. I hope you enjoy these. Here is the menu for tomorrows show. If I get a link I will post it tomorrow afternoon. It is that time of year.. Summer is coming to an end when Labor Day hits.. Our last 3 day weekend of the summer months. (Can you believe we haven't had a 3 day weekend since Memorial Day?) 4th of July was in the middle of the week.. So it does not count. Easy recipe to make flavorful chips and guacamole. The key is the spices.. Make sure you take a look at The Spice House website. If you are in the Chicago/WI areas stop past their shops! Summer is time for a light cookie. I like to make a double batch (if you have a 5qt mixer it will fit fine) and bake half now and the rest when you need some fresh cookies. Make sure your freezer does not have fish frozen as these cookies will absorb the favors. Lemon Fish Cookies are not that great.